A 100% untouched, un-sulfured, un-blended top Grenache from the great 2010 vintage left sleeping in a single 1000 liters Egg Number 9 deep inside our hemp winery. 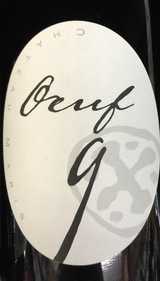 Made from 100% Grenache that spent 999 days in concrete eggs, the just-bottled 2010 Minervois la Liviniere Oeuf 9 is an exotic, singular, medium to full-bodied effort that offers tons of olive, cured meats, currants and dried spice-like aromas and flavors. Medium to full-bodied, textured, with savory, fine tannin, and a good finish, it's already approachable and shows a touch of evolution, yet my experience with these extended elevage wines is that they age slowly, so feel free to enjoy this anytime over the coming decade. Chateau Maris is a great place to start for readers looking to explore the Languedoc. These wines are all beautifully made and have tons of character, and in most cases, represent rock solid values.